Modest Petrovich Mussorgsky (21 March [O.S. 9 March] 1839 – 28 March [O.S. 16 March] 1881) was a Russian composer, one of the group known as "The Five". He was an innovator of Russian music in the romantic period. He strove to achieve a uniquely Russian musical identity, often in deliberate defiance of the established conventions of Western music. Many of his works were inspired by Russian history, Russian folklore, and other national themes. Such works include the opera Boris Godunov, the orchestral tone poem Night on Bald Mountain and the piano suite Pictures at an Exhibition. FFrom this peak a pattern of decline becomes increasingly apparent. Already the Balakirev circle was disintegrating. Mussorgsky was especially bitter about this. He wrote to Vladimir Stasov, "[T]he Mighty Handful has degenerated into soulless traitors." In drifting away from his old friends, Mussorgsky had been seen to fall victim to 'fits of madness' that could well have been alcoholism-related. His friend Viktor Hartmann had died, and his relative and recent roommate Arseny Golenishchev-Kutuzov (who furnished the poems for the song-cycle Sunless and would go on to provide those for the Songs and Dances of Death) had moved away to get married. Mussorgsky engaged a new and prominent personal private physician about 1870, Dr. George Leon Carrick, sometime Secretary and later President of the St. Petersburg Physicians' Society and a cousin of Sir Harry Lauder. While Mussorgsky suffered personally from alcoholism, it was also a behavior pattern considered typical for those of Mussorgsky's generation who wanted to oppose the establishment and protest through extreme forms of behavior. One contemporary notes, "an intense worship of Bacchus was considered to be almost obligatory for a writer of that period. It was a showing off, a 'pose,' for the best people of the [eighteen-]sixties." Another writes, "Talented people in Russia who love the simple folk cannot but drink." Mussorgsky spent day and night in a Saint Petersburg tavern of low repute, the Maly Yaroslavets, accompanied by other bohemian dropouts. He and his fellow drinkers idealized their alcoholism, perhaps seeing it as ethical and aesthetic opposition. This bravado, however, led to little more than isolation and eventual self-destruction. 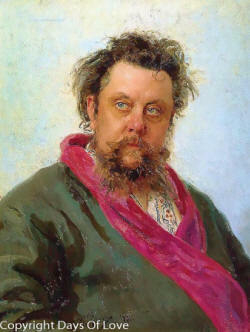 For a time Mussorgsky was able to maintain his creative output: his compositions from 1874 include Sunless, the Khovanshchina Prelude, and the piano suite Pictures at an Exhibition (in memory of Hartmann); he also began work on another opera based on Gogol, The Fair at Sorochyntsi (for which he produced another choral version of Night on Bald Mountain). In the years that followed, Mussorgsky's decline became increasingly steep. Although now part of a new circle of eminent personages that included singers, medical men and actors, he was increasingly unable to resist drinking, and a succession of deaths among his closest associates caused him great pain. At times, however, his alcoholism would seem to be in check, and among the most powerful works composed during his last six years are the four Songs and Dances of Death. His civil service career was made more precarious by his frequent 'illnesses' and absences, and he was fortunate to obtain a transfer to a post (in the Office of Government Control) where his music-loving superior treated him with great leniency – in 1879 even allowing him to spend three months touring twelve cities as a singer's accompanist. The decline could not be halted, however. In 1880 he was finally dismissed from government service. Aware of his destitution, one group of friends organised a stipend designed to support the completion of Khovanshchina; another group organised a similar fund to pay him to complete The Fair at Sorochyntsi. However, neither work was completed (although Khovanshchina, in piano score with only two numbers uncomposed, came close to being finished). IIn early 1881 a desperate Mussorgsky declared to a friend that there was 'nothing left but begging', and suffered four seizures in rapid succession. Though he found a comfortable room in a good hospital – and for several weeks even appeared to be rallying – the situation was hopeless. Repin painted the famous red-nosed portrait in what were to be the last days of the composer's life: a week after his 42nd birthday, he was dead. He was interred at the Tikhvin Cemetery of the Alexander Nevsky Monastery in Saint Petersburg. DDuring 1935 to 1937, in connection with the reconstruction and redevelopment of the so-called Necropolis of Masters of Arts, the square in front of the Lavra was substantially extended and the border line of the Tikhvin cemetery was accordingly moved. The Soviet government, however, moved only gravestones to a new location, and the tombs were covered with asphalt, including Mussorgsky's grave. The burial place of Mussorgsky is now a bus stop. Mussorgsky, like others of 'The Five', was perceived as extremist by the Emperor and much of his court. This may have been the reason Tsar Alexander III personally crossed off Boris Godunov from the list of proposed pieces for the Imperial Opera in 1888. Emerson, Caryl (1999). The Life of Musorgsky (1. publ. ed.). Cambridge [u.a. ]: Cambridge Univ. Press. p. 34. ISBN 978-0521485074. Kramer, Jonathan D. (1991). Listening to Music : The Essential Guide to the Classical Repertoire. London, United Kingdom: Random House UK Ltd (A Division of Random House Group). p. 484. ISBN 978-0413453310. Letter to Vladimir Stasov, 9 October 1875. As quoted in Rimsky-Korsakov (1923: pp. 154–55, footnote 24). Ashby, F., "The Carricks of St.Petersburg" in The Caledonian Phalanx – Scots in Russia, Edinburgh, 1987, p. 96. "The Ancestry of Sir Harry Lauder" by Gregory Lauder-Frost, F.S.A. Scot., in The Scottish Genealogist. vol. LIII, No. 2, June 2006, ISSN 0300-337X, pp. 74–87, where Dr.Carrick's mother is given as the sister of Harry Lauder's grandfather, John Lauder. Quoted in Sovietskaia muzyka (Soviet Music) 9 (1980), 104. As quoted in Volkov (1995: p. 87). Wilson, Scott. Resting Places: The Burial Sites of More Than 14,000 Famous Persons, 3d ed. : 2 (Kindle Locations 34064–65). McFarland & Company, Inc., Publishers. Kindle Edition. Brown and Abraham (1997: p. 125). Grove, George (1954-01-01). Grove's Dictionary of Music and Musicians. Vol. 5: L-m. Macmillan. ISBN 9780333191781.